We present the newly developed core concept for the Multidimensional Knapsack Problem (MKP) which is an extension of the classical concept for the one-dimensional case. The core for the multidimensional problem is defined in dependence of a chosen efficiency function of the items, since no single obvious efficiency measure is available for MKP. An empirical study on the cores of widely-used benchmark instances is presented, as well as experiments with different approximate core sizes. Furthermore we describe a memetic algorithm and a relaxation guided variable neighborhood search for the MKP, which are applied to the original and to the core problems. 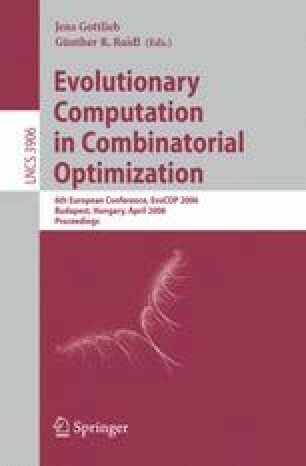 The experimental results show that given a fixed run-time, the different metaheuristics as well as a general purpose integer linear programming solver yield better solution when applied to approximate core problems of fixed size. This work is supported by RTN ADONET under grant 504438 and the Austrian Science Fund (FWF) under grant P16263-N04.